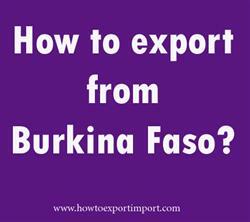 How to export from Burkina Faso? What are the export registration procedures, export customs process, export cargo movement methods in Burkina Faso? Explain the export methodology in Burkina Faso. Information given here explains about step by step procedures that need to be finished with Burkina Faso government authority for exportation from Burkina Faso. Inorder to obtain the exporter importer status in Burkina Faso, you are required to enroll in the commercial register and thus obtain the merchant card. Any legal entity who has registered with Tax Authority of Burkina Faso can start appropriate business and engage with international trade by fulfilling necessary requirements by the Government of Burkina Faso. Burkina Faso customs is the authority that responsible for the collection of all customs duties, excise duties on imported goods, ensuring the quality and authenticity of goods, prevention of trade and facilitate genuine trade. All export documentation must be completed correctly to avoid any missed shipments, port demurrage charges or fines to the business. This post explains about different phases in export process that every exporter needs to go through for completing export from Burkina Faso.